Before Penn he had never taken a humanities class in his life; now he lives and breathes the soft sciences. Aggrey Odera never would have anticipated that he’d be studying in the US, let alone that he’d be majoring in philosophy. Between his early morning swims and his late–night reading sessions, Street was able to catch up with this Penn senior and hear all about his past four years. 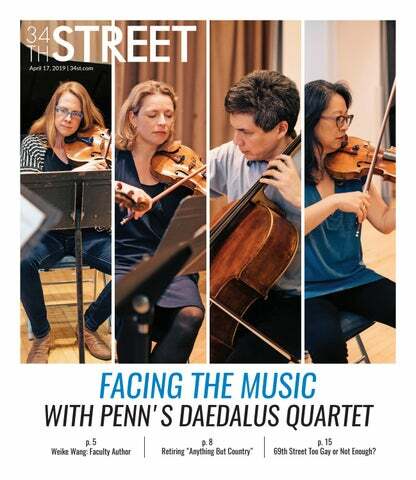 34th Street Magazine: Coming to Penn was quite the trek for you! What made you decide to come here in the first place? Aggrey Odera: I wasn’t planning on coming to school in the states, but my best friend got in here early decision (he’s actually my roommate now) and was like, “Dude, what are you doing?” So I ended up applying to a few US schools, got into some, and I knew he was coming here so I decided to come to Penn, as well. I came to Penn because of him. Street: What are the things that you like about being a student here at Penn? AO: I went to a high school in Kenya where we had a huge emphasis on the sciences, so when I came to Penn I had never taken a single humanities class in my life. What’s interesting is that if I had gone to university in Kenya, I would have studied engineering. For my parents, you’re either an engineer, a doctor, or a failure, which is a big thing amongst African families. Coming here and doing all this random stuff that I wasn’t expecting to do has made me grow as a human being, which has just been really incredible. It’s honestly been a wonderful four years and I’m scared to say goodbye to Penn because I’ve just been having the time of my life here. Street: You’ve mentioned before that you transferred into Wharton but ended up staying in the College. What led you to that decision in the end? AO: I don’t want to call it pressure because my parents didn’t pressure me, but it’s this feeling that is very pervasive around Penn of being here and feeling like if you’re not doing something preprofessional or technical, you’re not doing something worthwhile. My initial interest in transferring into Wharton was very aligned with this feeling. However, going into Wharton, I realized that there were just some things that I didn’t find necessary. By that, I mean there were things that I didn’t find useful to myself in my own personal studies. They are all very interesting and definitely useful classes, I just found that they weren’t what I envisioned college to be for myself. Street: I’ve also heard that you’ve been pretty politically involved on campus in the past. Could you tell me more about that? AO: The political discourse in my country is completely alienated from that of the U.S. We don’t speak about right or left, for example, or Democrat or Republican. Coming here, as part of my introduction to American culture, I had read a lot about political and philosophical theory. As a result, the first three years of my time year, I identified myself as a Marxist and that is the sort of discourse I would engage in. But gradually—this may be a result of philosophy—I’ve become much more unsure about my beliefs, which makes it very difficult for me to be affiliated with a political party. Politics is essentially a sticking of claims, but because I feel as though I am not intellectually capable of choosing between the claims that various political groups present, I have become shyer within my stance on politics. Street: What kind of things do you enjoy doing for fun or in your free time? AO: This might make me sound a bit intense, but I swim every morning for three thousand meters. It’s something I’ve done since high school. I also like to read a lot and that has been very useful. I enjoy arguing with people, and Penn is a great place for doing that too. I also really enjoy traveling, which has been a lot easier being here since the Kenyan school system did not allow a lot of opportunities for that. Street: What kind of books do you enjoy reading? AO: It’s been philosophy for me the past three years, but I’ve been trying to actively get away from that by reading a lot more fiction. Part of the reason why I tend to read more fiction is because of my frustration with philosophy. I initially entered into philosophy thinking that it could speak about everything, but I’ve come to realize that the world is much messier than philosophy seems to make it out to be. Fiction, being a depiction of life with no one really telling you what to think, is something I’ve been trying to get into more because of all of that. If you’re asking about my favorite book, my friends always accuse me of saying that every book I read I claim to be “the best book I’ve ever read.” But I would say that the actual best book I’ve ever read is actually non–fiction, The Power Broker: Robert Moses and the Fall of New York. In terms of fiction, my favorite book would be Anna Karenina by Leo Tolstoy. Street: What do you think you will miss most about Penn? AO: I think I will miss being in this environment where, aside from the responsibilities of being a student and going to classes, my time is my time. I can do the things that I enjoy and that interest me. I can meet up with friends and walk around whenever I want to. Once I go into work though, I’m going to be working 8 to 5 every day. Street: If you could give advice to your freshman self, what would you tell them? AO: As a freshman, I wanted to prove to everyone that the humanities matter. And I do believe they matter, but my way of proving that to people was to degrade whatever it was that they were doing. If I could give some advice to my freshman self, it would be to be gentler to people because it was a time when I was so intent on proving myself, that I might have intentionally or unintentionally been unkind to people. Street: Favorite spot on campus? Street: Something you can’t live without? AO: The idea that I’m loved and that I love people. Street: Favorite place you’ve traveled? Street: Describe your time here at Penn in one sentence. AO: I’ve felt intensely liberated yet intensely claustrophobic. AO: People who are trying to get this bread and people who don’t need this bread. AO: I don’t know, but I do think I am trying to get this bread.